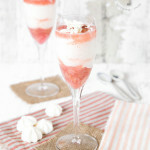 This rhubarb syllabub is almost as light as air, simple and quick enough to be made in 5 minutes before you eat it. It looks stunning served in individual glasses. I love syllabub, it is such a quintessentially English pudding, bringing to mind long hot languid summer days, pretty floral dresses, straw hats festooned with ribbons, and games of croquet after Sunday lunch. It is also simplicity personified to make, simply whip up some cream, add some sugar and then some wine or champagne, flavour and serve. This version uses up gently poached new season rhubarb, still soft and a pretty shade of pink, and is flavoured with some glorious rhubarb and vanilla curd. Serve layered into champagne flutes for an indulgent pudding to share with your Valentine, or to serve at a dinner party. I am a huge fan of using an artisan specialty “hero” ingredient to make a simple dish shine, the star here was a pot of rhubarb and vanilla curd, from Scarlet & Mustard (the founders of the company must be Cluedo fans surely? ), sold by Caprera, an online artisanal market for food lovers. Currently there are 6 curds in their range, including delicious sounding passion fruit & lemon as well as toffee apple. 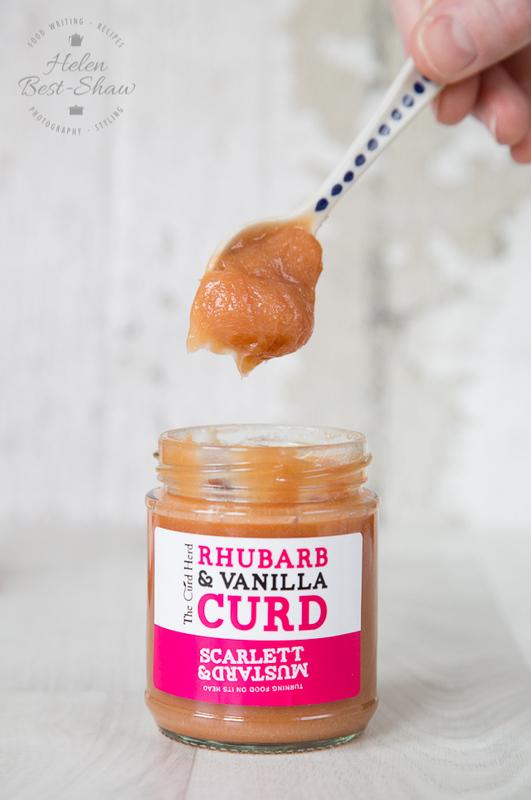 The rhubarb and vanilla curd I used is beautifully flavoured, the tartness of the rhubarb nicely offsetting the sugar in the curd. At £3.30 a jar it is an affordable treat. Add a few lemon stars from Oomeringues for crunch and texture and you have a perfect pudding. Importantly for me both products are made with eggs from free range hens so I can enjoy them with no guilt. If you are a little stuck for ideas for your Valentine this year than Caprera have a range of foodies hampers, the hamper for him contains small batch Jensen’s gin, BWT tonic water and craft cider together with a mixed Charcuterie Platter. The hamper for her has sweet treats of cakes, brownies all to be washed down with an elderflower drink. So you can make this syllabub really quickly I’d advise cooking a batch of rhubarb the day before, it will keep in the fridge for a week, and is perfect for adding to your porridge and cereals. 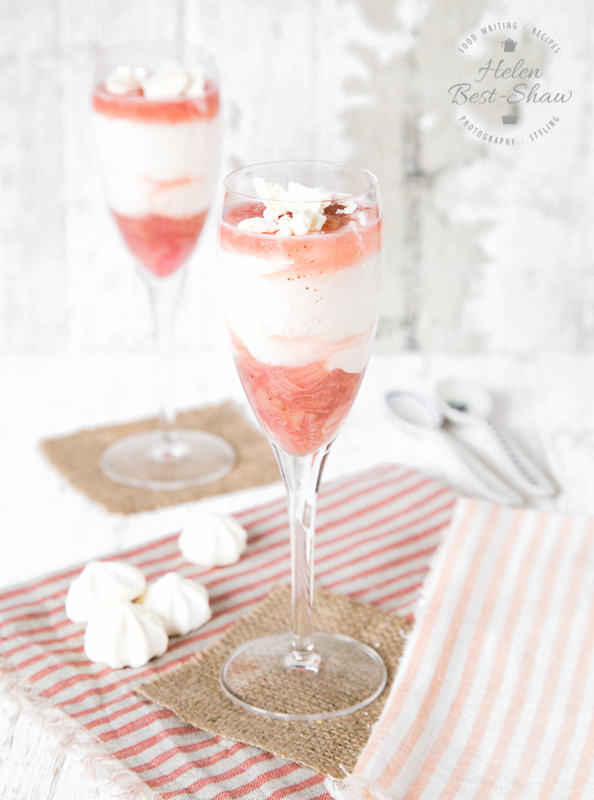 If you try this Delicious Vanilla and Rhubarb Syllabub please tag #FussFreeFlavours on Instagram or Twitter. It is amazing for me when for me when you make one of my recipes and I really do love to see them. You can also share it on my Facebook page. Please pin this recipe to Pinterest too! Thanks for reading Fuss Free Flavours! Cut the rhubarb into 1cm pieces. Place all the ingredients in a saucepan, and place on a medium heat. Cook only until the rhubarb is just soft and still holds its shape – as it cools, it will continue to cook. For an added citrus edge add the juice of half a lemon. Place the cream and icing sugar into a large bowl, and whip with an electric mixer until the cream holds a soft peak. Add the curd and wine and carry on whipping until the mixture has thickened, but is still floppy (if the syllabub thickens too much add some milk to thin it). 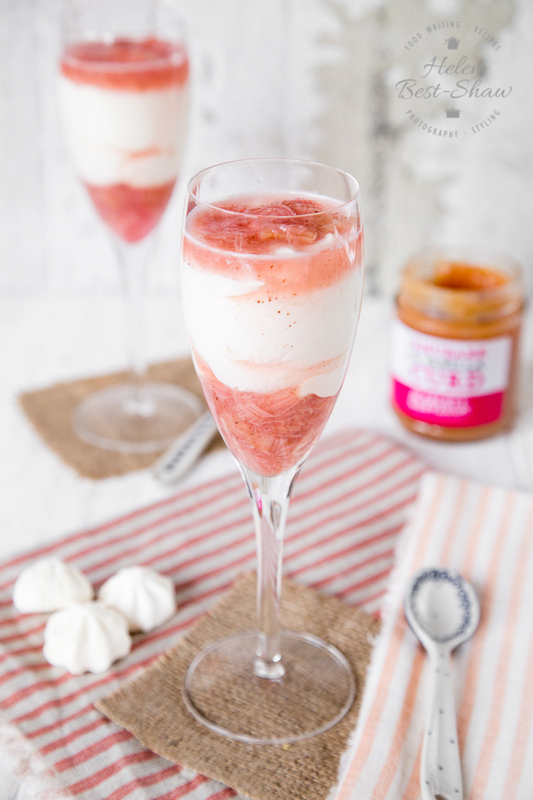 Add a spoon of poached rhubarb to two champagne flutes, layer some syllabub on top and top with some more rhubarb - the easiest way to do this neatly is to use a jam funnel. Chill until ready to serve garnished with some crushed meringues. If you are making this in advance check that your serving glasses will fit in the fridge.